(Al Hartmann | Tribune file photo) A male sage grouse does his showy mating strut to females just off Highway 65 south of Henefer in Utah. Environmental groups are suing in federal court to challenge moves by the Trump administration to rollback limits on oil and gas development in and near sage grouse habitat. Environmental groups are suing the Trump administration over its rollback of hard-won limits on oil and gas development in and near sage grouse habitat, restrictions that were part of an Obama-era plan to keep the iconic Western bird off the endangered list. In September 2015, the Interior Department released a major sage grouse conservation package in the form of amendments to 98 plans guiding mineral development and grazing on lands managed by the Bureau of Land Management and U.S. Forest Service. Utah officials panned the conservation plan for its potential to severely limit oil and gas drilling and to discourage voluntary conservation measures. A key part of the plan was designating “priority” and “general” habitat management areas where energy development would be discouraged in favor of drilling elsewhere. But under Trump’s vision of “American energy dominance,” which seeks to set aside some obstacles to development on public land, the BLM is illegally ignoring the plan, according to the U.S. District Court lawsuit filed Monday in Boise by the Center for Biological Diversity and Western Watersheds Project. The court action seeks to undo the Trump administration’s policies and recent leasing decisions involving key sage grouse habitat. Federal agencies do not generally comment on pending lawsuits and a BLM spokesperson was not available Monday. 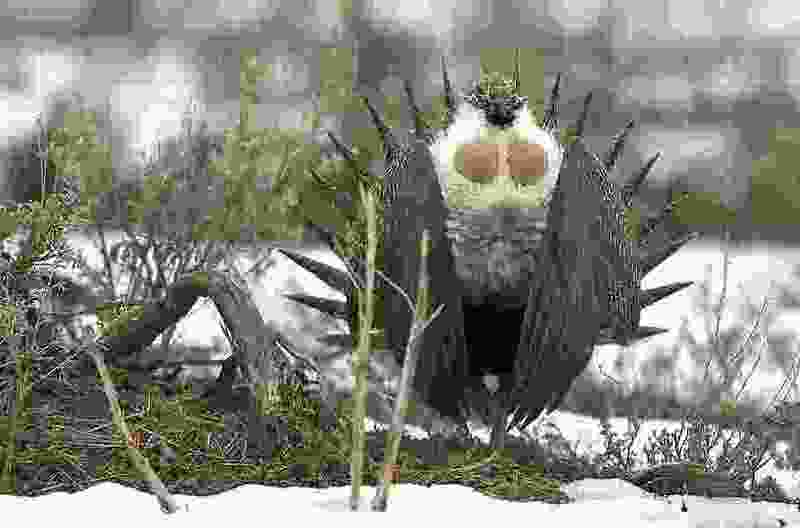 “The one thing the Obama administration got right, amid all the compromises in their sage-grouse plans, was to shift oil and gas leasing and development away from sage-grouse habitats, because you can’t destroy sage-grouse habitats if they’re never leased,” said Erik Molvar of Western Watersheds Project, based in Hailey, Idaho. Each year since the conservation plan was adopted, the BLM has offered more and more habitat for oil and gas leasing in apparent defiance of the conservation plan’s rules. According to the lawsuit, the BLM offered 225,000 acres of designated habitat in 2016, then 588,000 in 2017, and now nearly 1.4 million acres in the first three quarters of 2018. “Individually and cumulatively, these oil and gas leases threaten substantial degradation and fragmentation of key sage-grouse habitats, and harm to sage-grouse populations,” the suit states. The court action takes aim at eight BLM lease sales in five states, including two in Utah, that the environmental groups say invites drilling in lands the Department of Interior has previously designated as “priority” sage grouse habitat. Last June, the BLM solicited bids on nine parcels around Sheeprocks, an area near Nephi where Utah’s most imperiled sage grouse population lives. That sale was a bust after only three parcels were leased for the minimum $2 an acre bid. But an upcoming September sale, targeting lands in Rich, Summit and Utah counties, has far more overlap with sage grouse. Up for auction are 76 parcels covering 159,000 acres, including lands near Emma Park and south of Woodruff that are designated as priority habitat. The suit complains that an environmental study provides no evidence that the BLM consider whether public lands outside of sage-grouse habitat might be more suitable for new leasing.